8-week,6-day a week, often 2x/day training program specifically designed to prepare athletes for the US Air Force Tactical Air Control Party Technical School (USAF TACP). The plan is designed to be completed the 8 weeks directly prior to your course start week. This program follows a general format and gets progressively harder each week, until week 8, when the training tapers down into the start of School. 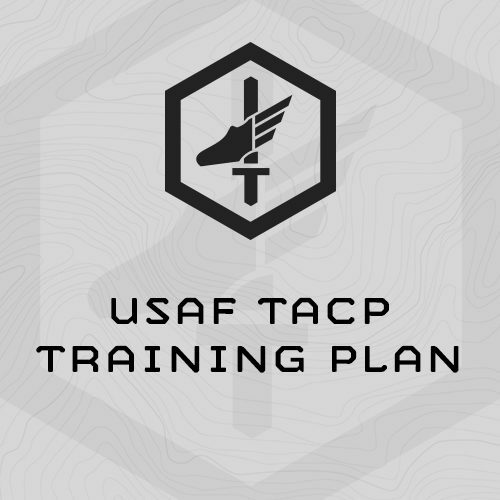 The plan is “sport specific” to the fitness demands you’ll face at TACP school – specifically PAST preparation, bodyweight work capacity “smoke sessions,” running, and rucking. It aims to build your “combat chassis” – legs, core, lungs and heart, overall durability, and endurance/stamina for long days on your feet, in kit, during school. The plan has 48 Total Training Sessions. It is intended that you’ll train Monday – Saturday, and take Sunday’s off. Saturdays are reserved for long, “mini events” which include running, rucking, and work capacity smokers. These efforts range from 120-240 minutes in duration. GPS-enabled Watch. A GPS enabled watch will make measuring run and ruck distances much easier, as well as maintaining required pacing. We like the Garmin Forerunner 10 or Foreunner 15. 60# and 80# Sandbag. We sell sandbags HERE … or you can use any old duffle bag. Wood Pellets or mulch made from ground up tires make great filler. 10# Sledge hammer or dumbbell. You’ll carry this while rucking. Still start at the beginning of this training plan anyway. Don’t skip ahead. Complete week 8 directly before selection. What if I can’t make the prescribed reps for the bodyweight exercises, or the prescribed interval times for the rucks/runs? Click HERE for our nutritional guidelines. I looked at the Sample Training and I’m not ready for this plan. Is there another I should start with? Start with the Military On-Ramp Training Plan. 60# and 80# Sandbag. We sell sandbags HERE ... or you can use any old duffle bag. Wood Pellets or mulch made from ground up tires make great filler. Just wanted to let you know I followed your USAF TACP plan and supplemented some weight training prior to the ALO assessment.